After lunch and a bit of football I was back at my crafty desk. This time I am playing along with Muse. Laurel Beard was our muse this week. Her card is pictured below. I used Wplus9's Festive Greetings (cause I gotta have the lights!) and Altenew's in line Alphas. First I stamped and colored a bunch of light strings. I tried to keep the colors in order but it didn't happen. Next I laid out my dies, measured made sure they were straight and ploped them down on my cutting mat and sent them through. Since there are 2 r's I had to leave space to cut the second one on the next pass through. Somehow during my placing the dies on the cutting plate the first r went wonky. Fortunately with a word like merry it can be off kilter, and I think it adds to the festivity of the card. So I purposely cut the second r off kilter as well. I mounted the die cut letters onto black fun foam and replaced them into the panel once it had been adhered to the card base. Lastly a bit of shimmer for all those bulbs courtesy of a Spectrum Noir shimmer brush pen. Thanks much for coming by! all the lights and "hidden" sentiment are very merry - and very cute too!! I think it was a happy accident your "merry" dies moved - the sentiment echoes the lines of lights beautifully! Great save on your alphas, Cat! I love the strands of tree lights and how perfectly they work with this technique! Oh too cute--just love this, Cat! The wonky r letters look planned! Such a pretty card for the holidays! I love all of the colors you used and the technique is perfect. I love your wonky merry Cat! 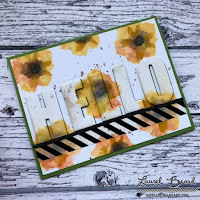 Great take on Laurels card! This is so fun and festive! Thanks for joining us at Muse this week, Cat! Such a festive and fun card...beautifully executed. Plus one more Christmas card done for the season.